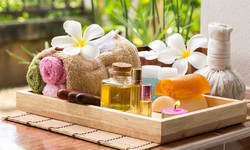 Aromatherapy Massage is a wonderfully relaxing therapy combining deeply soothing massage techniques with the use of essential oils. These oils are extracted from plants and have been used for thousands of years to benefit physical and mental well-being. Indulge in this authentic therapy with uplifting combination of aroma oils selected from carefully cold pressed anfioxidantrich base oils to provide a gentle relaxing massage which works on the senses as much as it works on the skin and nerve endings. Surrender yourself to a thoroughly pampering experience!!! The main energy centers are referred to as chakra chakra is a Sanskrit word which means wheel. A chakra is a wheel-like spinning vortex that whirls in a circular motion forming a vacuum in the center that draws in anything it encounters on its particular vibratory level. roma Therapy is in practice since ancient times. This therapy can be used to help humanity in a gentle, pleasant and safe manner. This therapy is a form of gentle, yet effective treatment in which fragrant essence from plants are used. Aroma Therapy is a combination of massage and aromatic liquid substances known as essential oils. Essential oils are extracted from certain species of flowers, grasses, fruits, leaves, roots and trees. There are around 300 essential oils used in medicine and the food and cosmetic industries. Aura-Chakra Scanning also helps to identify & analyze the Karmic lessons one has to learn and one can then resolve past Karmas through Enlightenment, Purification, Service and/or Meditation. Aroma Therapies : Basil, Eucalyptus, Lemon Grass, Tea Tree, Camphor, Clove etc. Aromatherapy massage has a more holistic approach to the massage yet will concentrate on more relaxing strokes, but of prime importance is the selection of essential oil/s used during the massage, since they are chosen for their therapeutic effect, and not the fragrance as such. This course provide the basic knowledge of aromatherapy treatments for beauty problem. 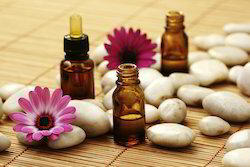 Use of essential oils & carrier oils, their properties, blendings, methods of application etc are included.